Sometimes when it comes to holidays, its not always the "healthiest" food. 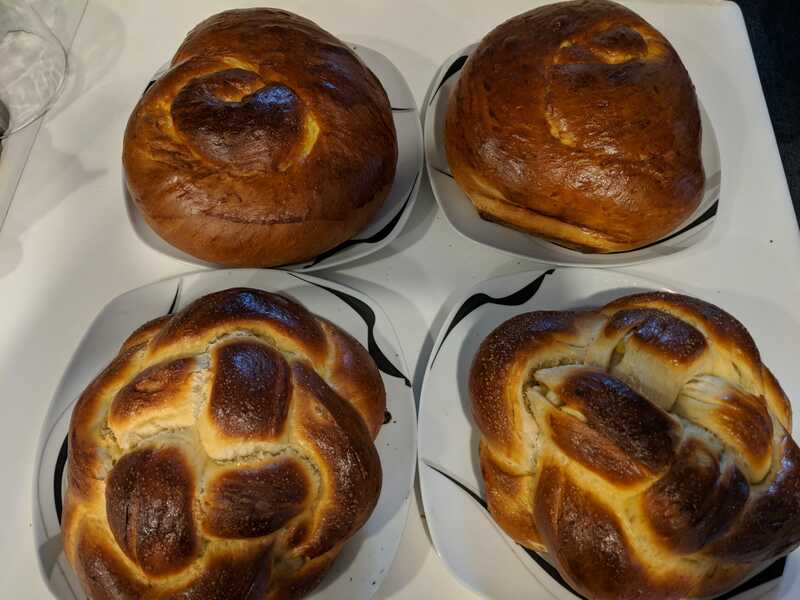 I baked these challah yesterday for my family and posted the picture on Facebook and so many of you wanted the recipe, so I thought it would be best to just put it up here on my blog. As you see on my blog, the recipes I generally post are "healthy" ones, this one, well, its just a simple bread, not healthy but delicious, What i did to make it as healthy as you can is that I used only organic products, the flour was organic bread flour, the salt was sea salt and so on, If a recipe you want to make is not on the "healthy" list begin with organic products so at least there are no preservatives, gmo or items you don't want in your body. Now go Enjoy it. For years I have been baking my friend Resa's mothers recipe for challah for my family. This year I added raisins on the final rise before I formed it to add some sweetness for the holiday of Rosh HaShanah. 1. Place yeast, tsp. sugar and 2 tsp. flour in tall glass-mix with ¾ cup warm water and let sit for 10 minutes. 3. Add yeast mixture - mix and add 2 ¼ - 2 ½ cups flour gradually. Knead until smooth and elastic - about 10 minutes by hand - 5 minutes by machine. 4. Cover with plastic wrap and set in warm place for 2 ½ hours or refrigerate overnight. 5. Knock down and add about ½ cup flour on board as you knead again. Dough should be soft but not sticky. 6. Oil top of dough in bowl with ½ tbs. oil and cover to rise again for 1 ½ hours. 7. Divide dough into 2 pieces. Grease sheet. and rolled around itself for a round challah. c. Piece can be placed in greased loaf pan. Two challahs can be placed on one greased cookie sheet. 8. Cover and let rise 1 hour. 10 Combine ½ egg and 2 tsp. sugar and brush tops - sprinkle with seeds - Bake 45 minutes. Let cool and enjoy! Freezes very well. The other recipe Honey, apple Challah was one I got from the Tori Avey blog. I subscribed to her list and daily receive wonderful recipes. Here is the link for the delicious apple challah. This challah was delicious - but took a lot longer of my time to roll out and stuff, but everyone raved about it. Try them both and see what you prefer. When I cook the first one, I like to put sesame seeds on top of it, but be creative, the raisins inside yesterday were delicious.